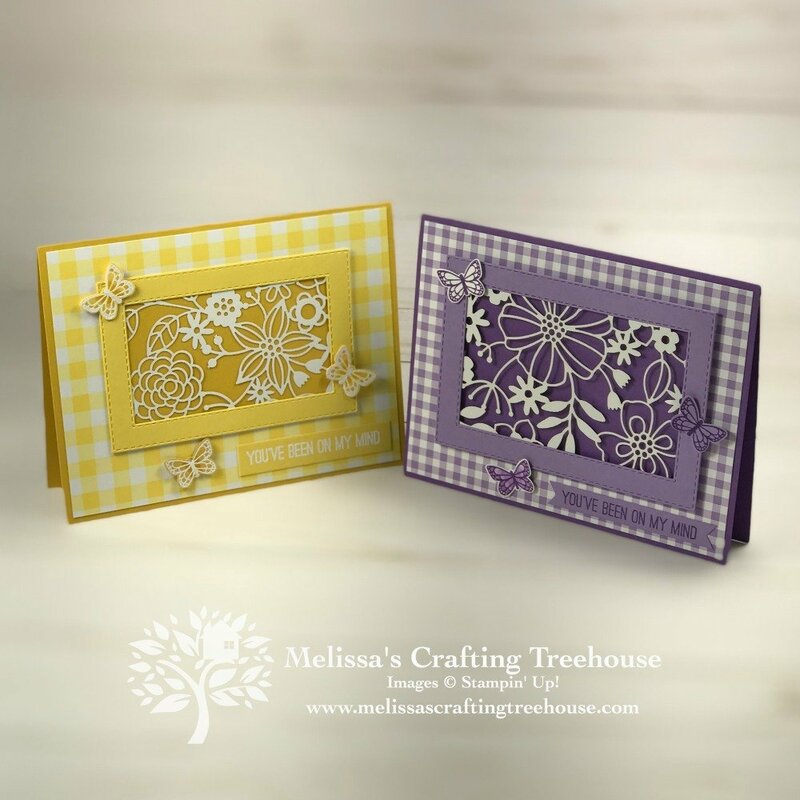 Are you ready to see some fun projects from the April Simple Suite Stampers Tutorial Bundle? 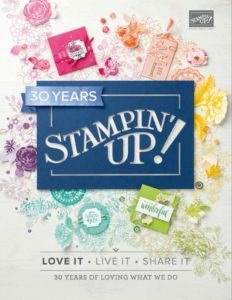 Each month we create a set of 8 tutorials that feature a specific Stampin’ Up! product suite. This months tutorial bundle includes projects made with the Gingham Gala product suite which is on pages 34 to 35 of the 2019 Occasions Catalog. In addition to including Gingham elements, as the title suggests, this suite is filled with butterflies galore and it’s just so fun! In this post, I’ll be giving you a bit of a sneak peek into the tutorial bundle, by showing three of the projects in the bundle. 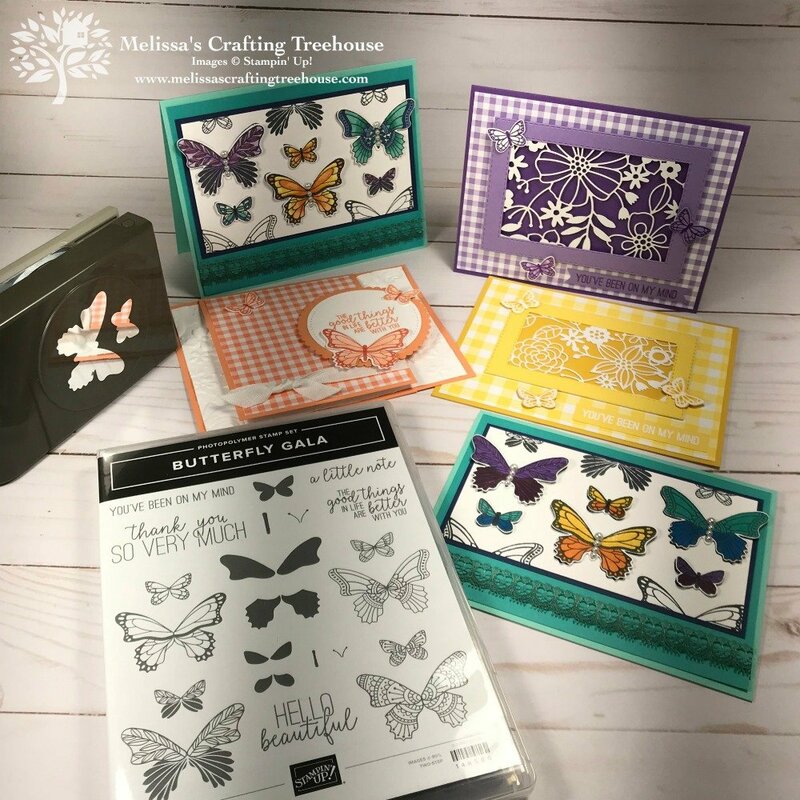 All three of today’s projects use the Butterfly Gala Bundle which includes the stamp set and coordinating punch shown below. 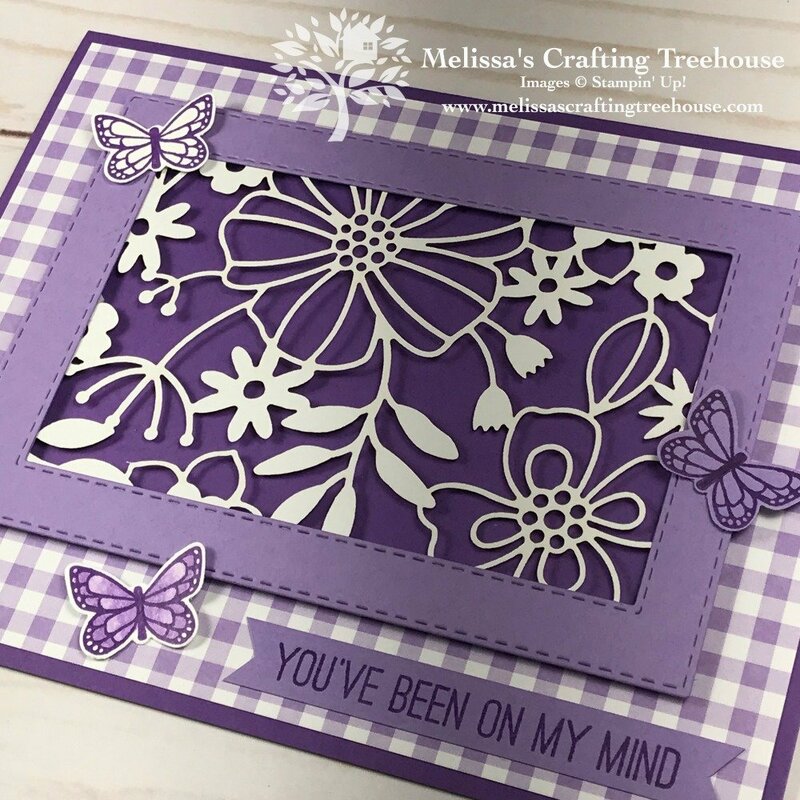 The first card design is based on the tutorial created by Debie Deschaine, one of the Simple Suite Stampers design team members. So when recreating someone else’s project invariably I don’t have exactly the products they used so I usually end up changing things up a bit. I figure that’s all part of the fun! Either way aside from a few small changes this is very much like Debie’s card. 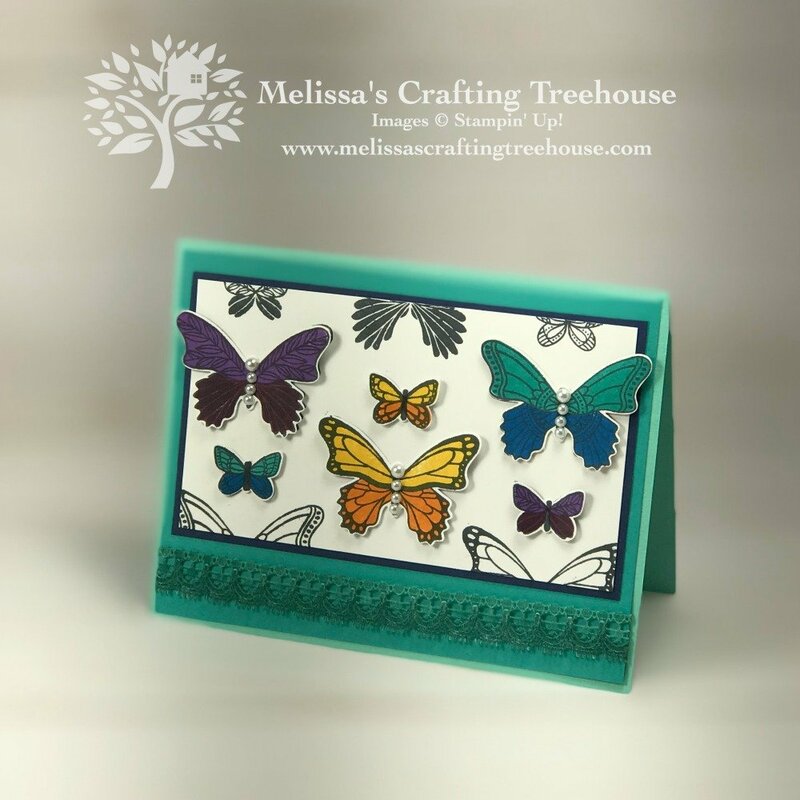 The butterflies are heat embossed in white and colored in with light and dark Daffodil Delight Blends Alcohol Markers. The frame is made with the Rectangle Stitched Framelits (p. 28 of the Occasions Catalog). For this card the 4th and 6th biggest framelits in the set were used. The inside of the frame is made using the Beautifully Detailed Laser-Cut Specialty Paper (p. 189 of the Annual Catalog). This is such pretty paper! So I felt compelled to create another version of this card and mix things up a bit! I created a larger frame with the Rectangle Stitched Framelits. In this case, I used the 3rd and 5th biggest framelits in the set. The frame is also popped up on dimensionals whereas on the version in yellows it was flat on the card. For this second version I used the smaller gingham side of the DSP, instead of the large pattern. The next project today was designed by Katina Martinez and it’s a bit of a fun fold / unusual opening card. 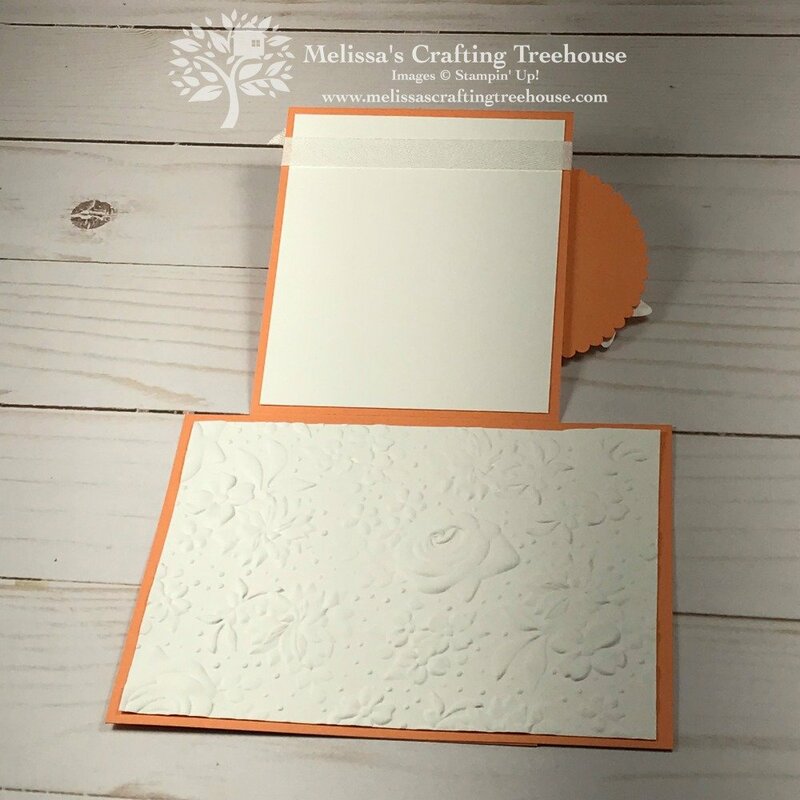 Instead of opening like a traditional card, the Grapefruit Grove flap on the front flips up to reveal the gorgeous dry embossed inside! A whisper white panel is included on the backside of the open panel, so there is somewhere to write a note. 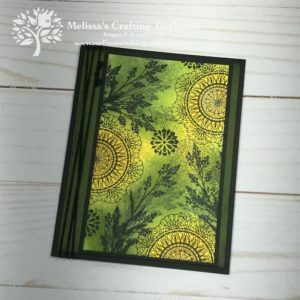 These next card designs were the focus of my tutorial bundle project. 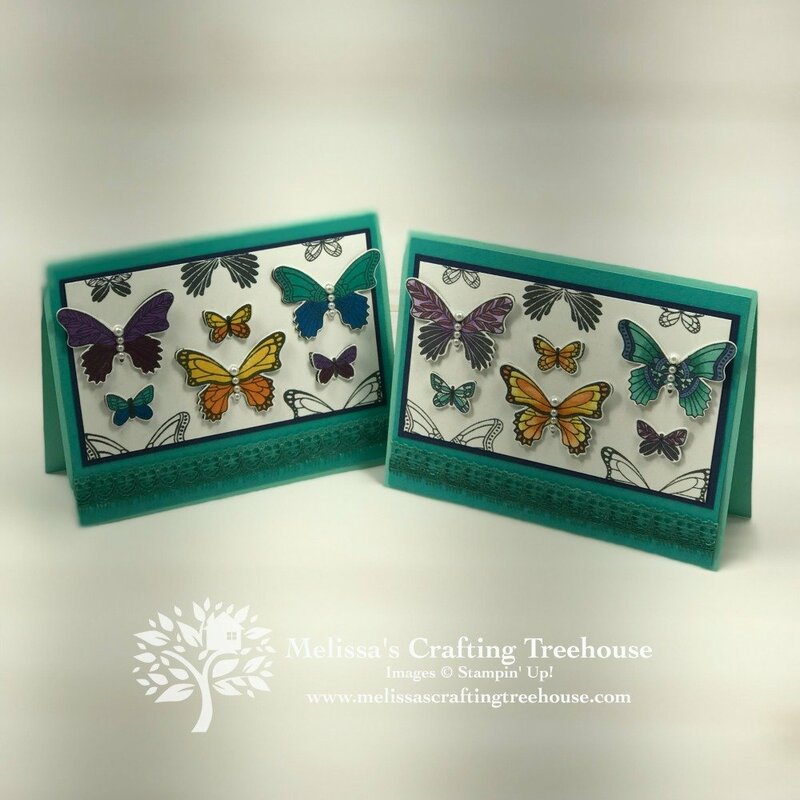 In my facebook live I showed two ways to create the punched butterflies, one way that is less time time-consuming and a second method that is more time-consuming. 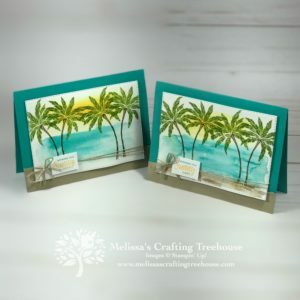 The card shown here uses simple two step stamping and is the quicker way to make this card. 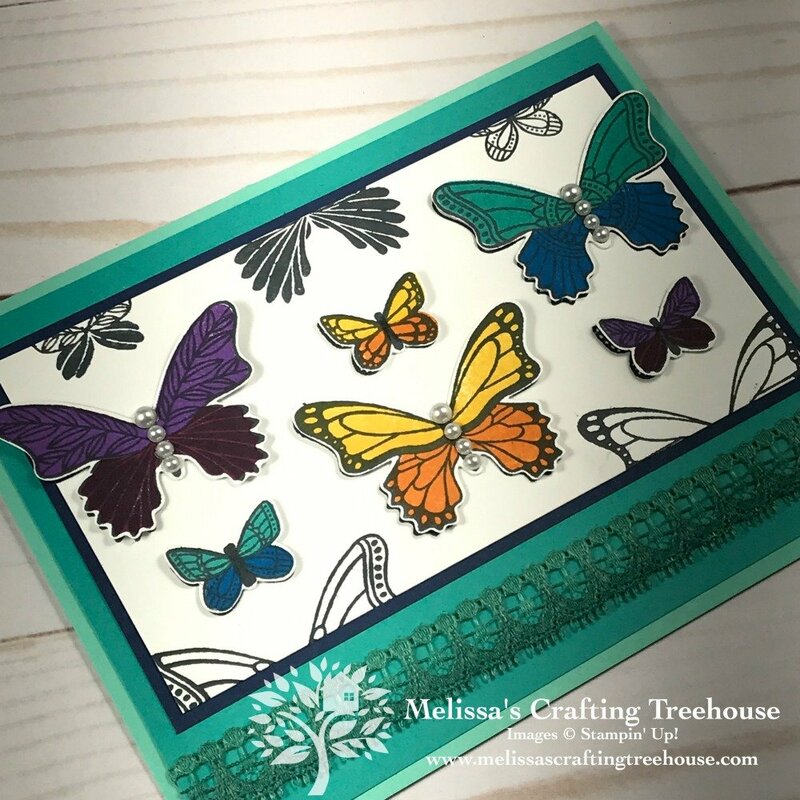 There are images in this stamp set that allow you to “color in” both the small and large butterflies withOUT coloring with a marker or other coloring tool. 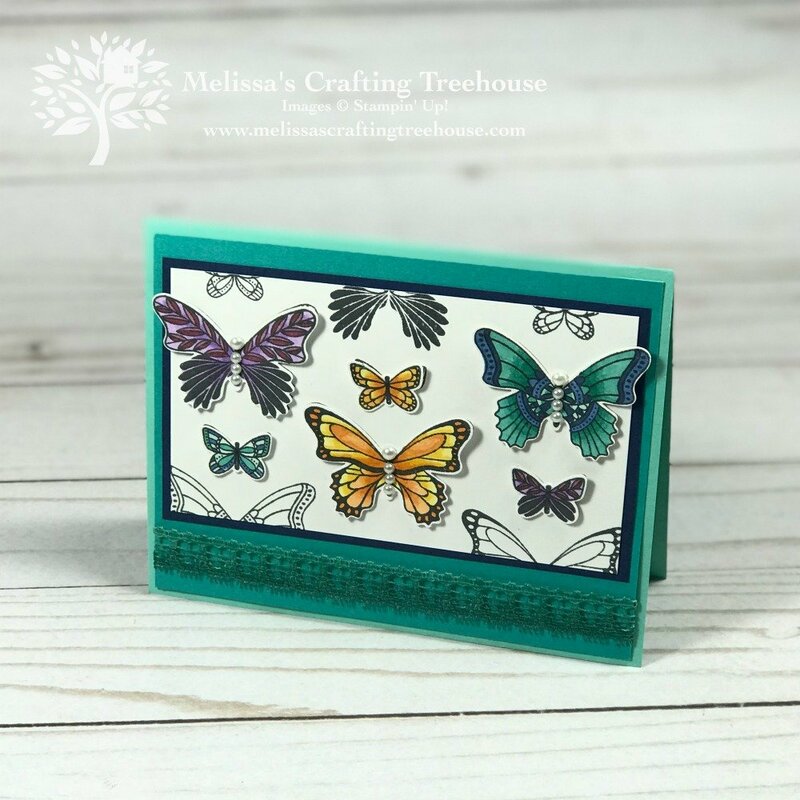 Essentially, there are separate stamps for the top and bottom sections of each butterfly, therefore allowing you to stamp a different color on the top vs on the bottom. This is a much quicker method than actual coloring in! For this next version I used a variety of blends alcohol markers to color in each butterfly individually. The result is quite beautiful but it’s also time consuming to do. I showed both methods in my video tutorial that you’ll find later in this post. 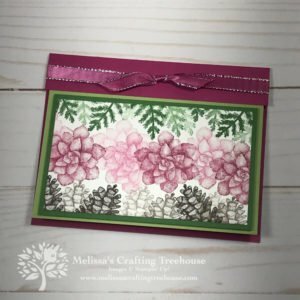 In the video you’ll also see how I created the ombre lace trim at the bottom of this card. Which version do you prefer? 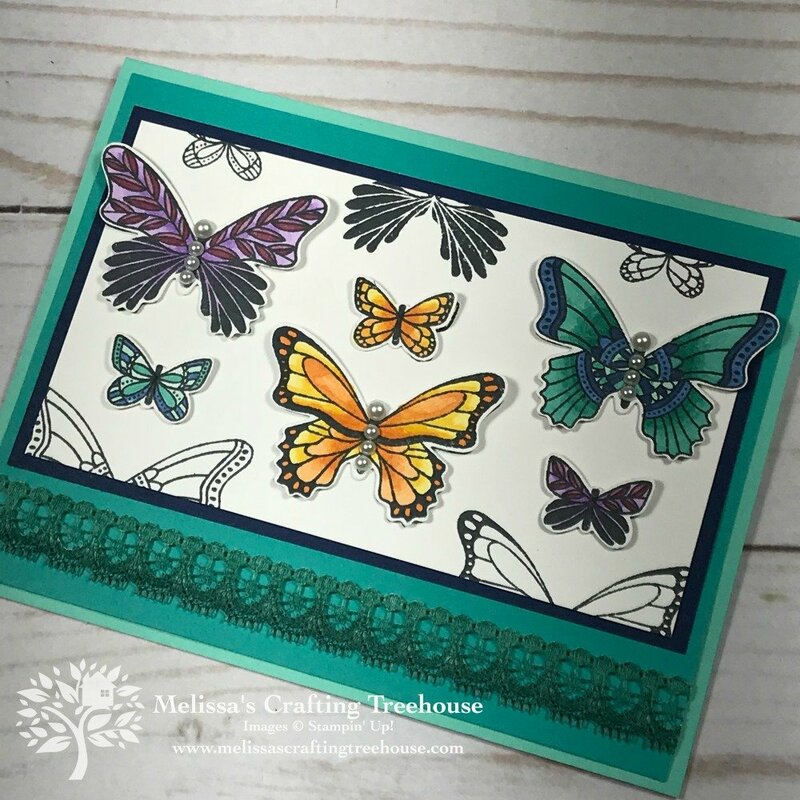 Do enjoy coloring with the Blends Alcohol Markers or do you prefer a simpler, quicker method to “color in” your butterflies. Leave a comment and let me know! What do you think? 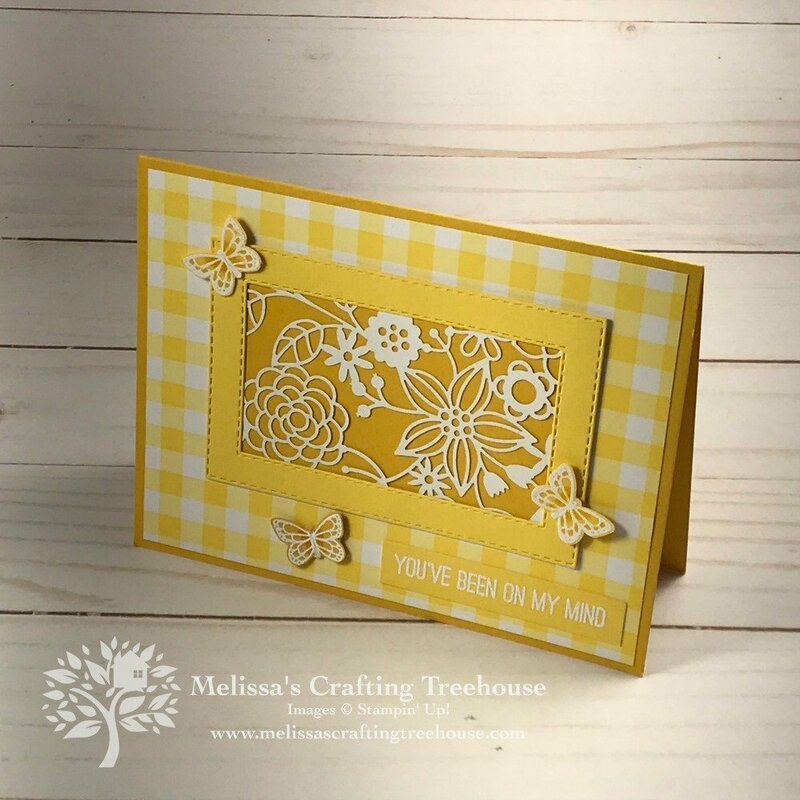 Aren’t these projects a great sneak peek of the April Simple Suite Stampers Tutorial Bundle and Gingham Gala product suite!? If you enjoyed today’s projects you might really enjoy this months Tutorial Bundle! You should know that I have not included project dimensions, on purpose, since these tutorials are exclusive to the bundle. However, there is a complete supply list ahead. 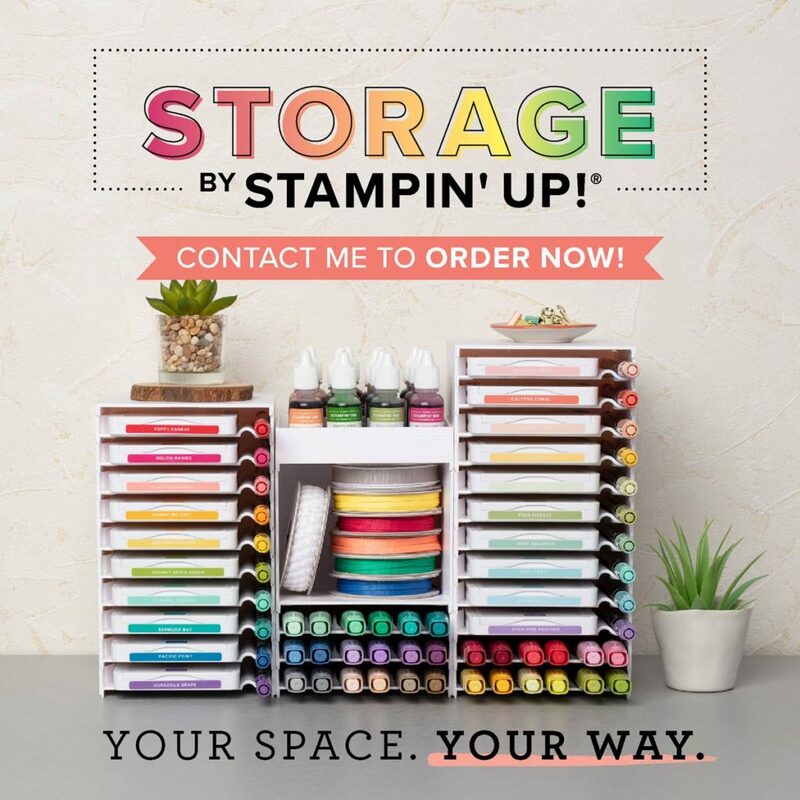 Become an Email Subscriber and get the March Simple Suite Stamper’s Tutorial Bundle FREE with a $35 merchandise order, when you use the current hostess code! Click HERE to subscribe! If you’re not a subscriber and you don’t want to become a subscriber, you can still get the tutorial bundle for FREE when you purchase $75 in merchandise through my online store, using the current hostess code! At this purchase level you’ll also get Free Card Kits in the mail! Do NOT use the hostess code if your order is $150 or more. In that case, you’ll get hostess rewards PLUS the March tutorial bundle FREE. Includes 8 Tutorials featuring the Gingham Gala Product Suite! Each month a new tutorial bundle will be available that features a different product suite. 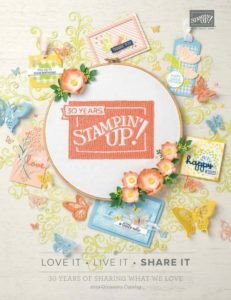 Buy the Stampin’ Up! Starter Kit and become a Treehouse Chick Team Member! Get $125 in product for just $99 when you buy the Starter Kit! 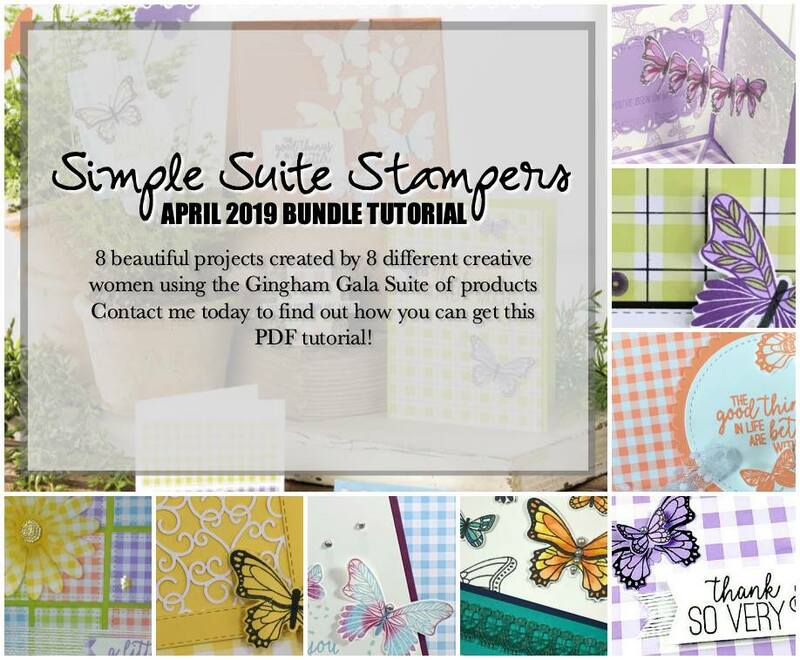 Get a NEW Simple Suite Stampers Tutorial bundle EVERY Month FREE! 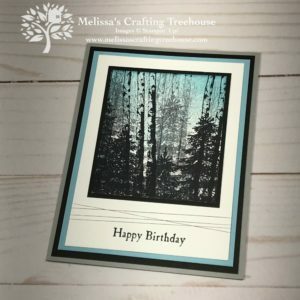 Become a part of an awesome group of fellow paper crafting enthusiasts and technique lovers! Get a minimum 20% discount on all your orders! Plus, there’s NO Long Term Commitment, NO Penalty for dropping. It’s a great time to buy the starter kit! If you join now, you’ll get to see and preorder from the new annual catalog starting in May. The catalog goes live to customers on June, 4, 2019! There are lots more perks too! Click HERE to learn more. Wanna see more with this product suite? Click HERE to see another project! 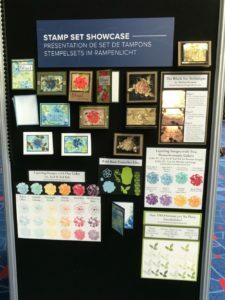 The project dimensions and tips for this project are exclusive to the April 2019 Simple Suite Stampers Tutorial Bundle. Get this bundle of 8 tutorials for FREE with a qualifying purchase. Become a Newsletter Subscriber and get this Tutorial Bundle FREE when you use the current hostess code and place an order of $35 or more in merchandise! Click HERE to subscribe! Not a subscriber? 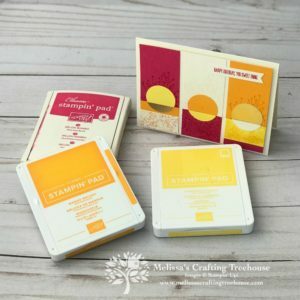 Get the Simple Suite Stamper’s Tutorial Bundle FREE when you use the current hostess code and place an order of $75 or more in merchandise. DO NOT USE THE HOSTESS CODE IF YOUR ORDER IS $150 OR MORE! In this case, you’ll still get the tutorial bundle FREE plus you’ll also GET HOSTESS REWARDS too!